This is such a simple dessert to make, and yet still gorgeous and sure to impress your family or guests. They're always a huge hit when I make them, and vanish quickly! They also happen to be vegan-friendly, so I always make them for potlucks when my vegan friends are going to be attending. Go ahead, give them a try. You'll be glad you did. Preheat oven to 350F. 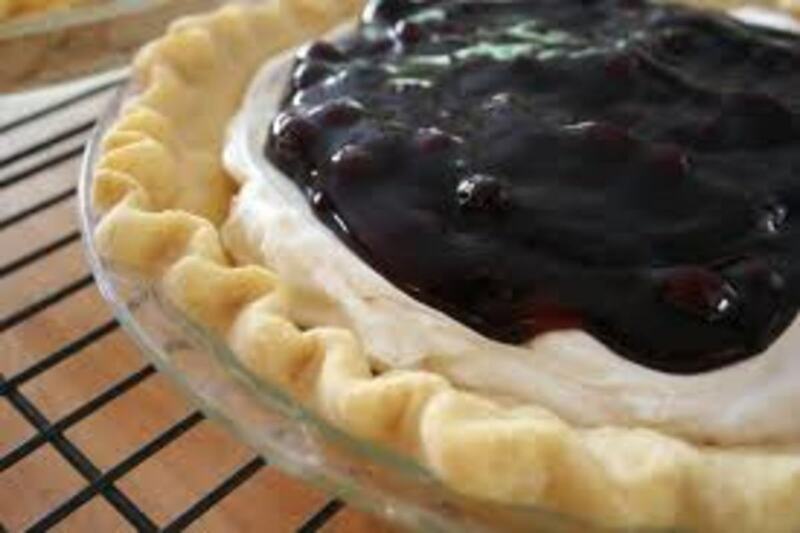 For crust, mix together 1 1/2 cups flour and salt in a bowl. 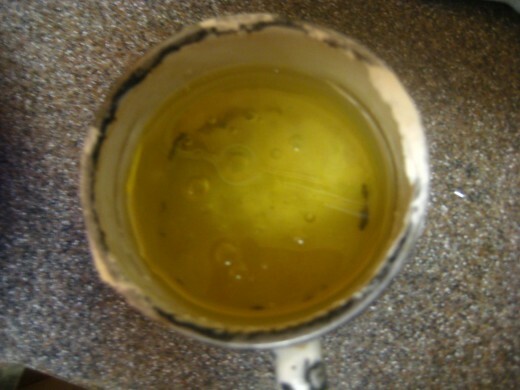 Measure out the oil, then add 4 tablespoons water to the measuring cup. 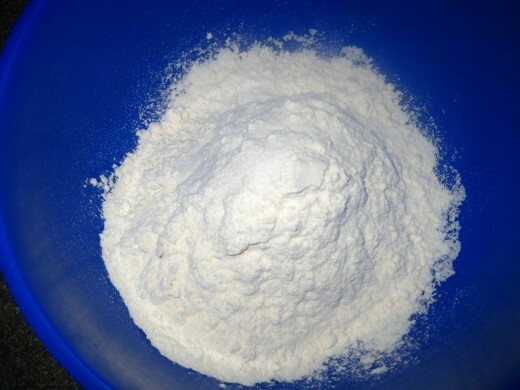 Mix the oil and water with a fork before adding to the flour mix. 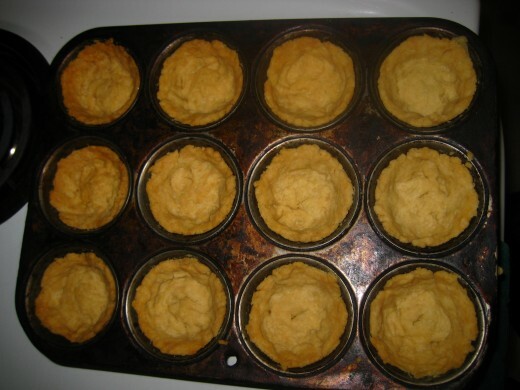 Stir it all together well with a fork, grease muffin tins, and divide the crust evenly, putting a chunk in each cup. With your thumbs, smoosh it around to cover the inside of each cup. Put the empty crusts in oven, and bake for 30 minutes or until they're golden brown around the edges. While you wait, start on the filling. 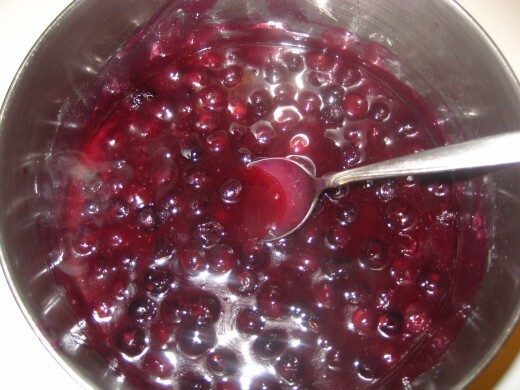 For the filling, put 2 cups blueberries in saucepan. Add 1/2 cup sugar, 1/3 cup water and 1/4 teaspoon cinnamon. Cook for 5 mins over medium heat, stirring constantly. Add 2 tablespoons flour and mix it in well. Add the lemon juice. Bring to a boil, still stirring. 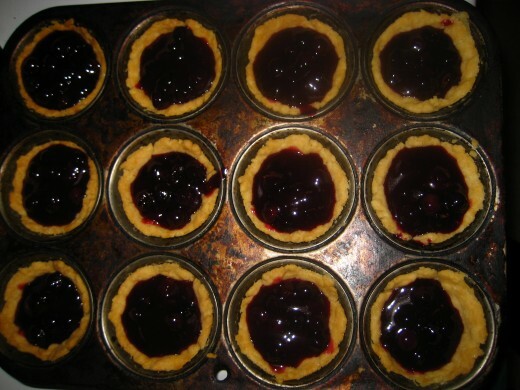 When crusts are done, spoon in the berry mixture and allow to cool. 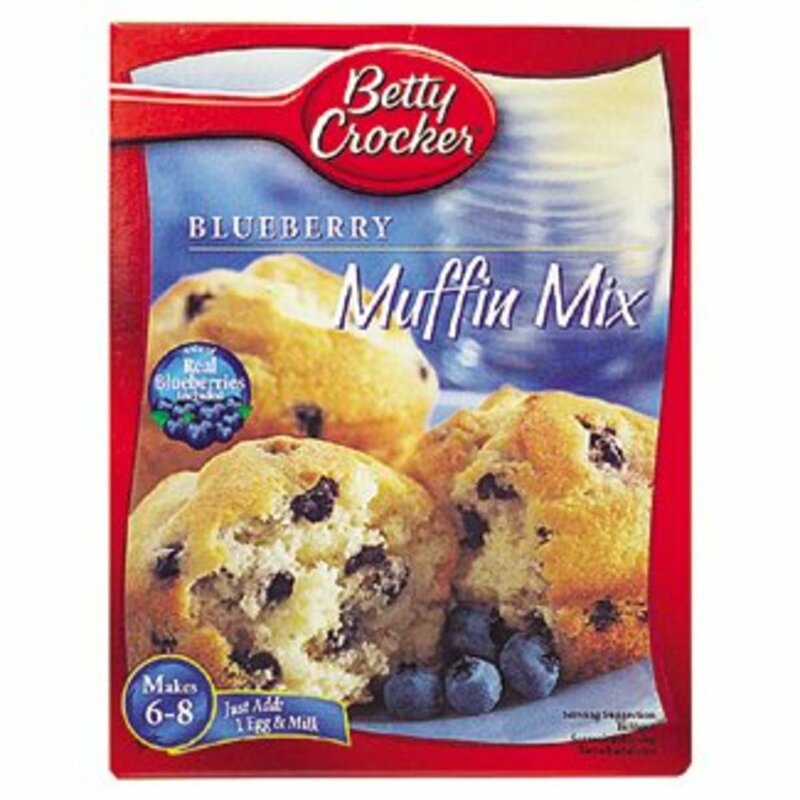 Mix together 1/2 teaspoon salt with 1 1/2 cups flour, in a bowl. Measure out 1/2 cup of vegetable oil. Add 4 tablespoons cold water to the oil, and use a fork to whisk it together well. 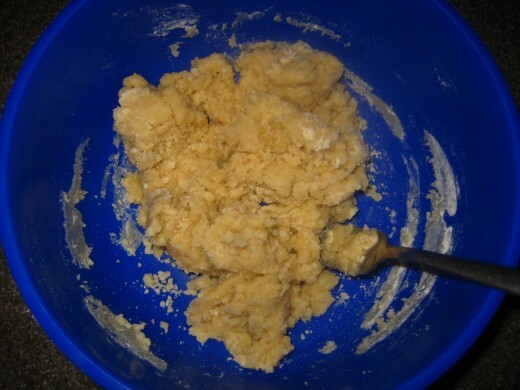 Mix the oil mixture and the flour mixture together, using a fork. It should be soft and a bit crumbly. This crust, although delicious, doesn't take well to being rolled out. 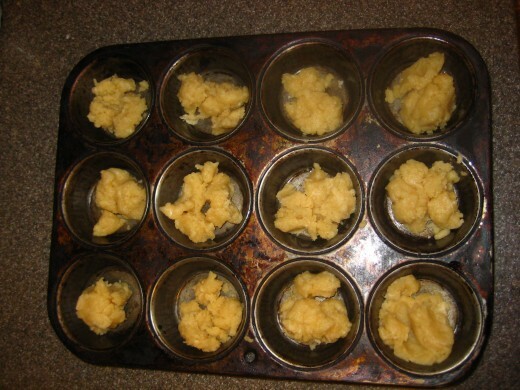 Instead, divide it evenly between the muffin cups, as shown above. 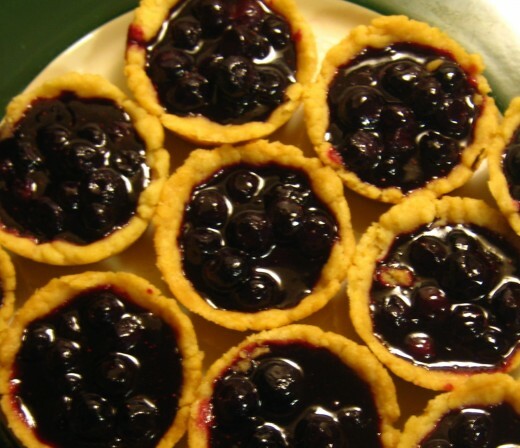 With your fingers, smoosh the dough into a crust that covers the inside of each cup. When done, put in the oven to bake at 350F for 30 minutes or until the edges are golden brown. 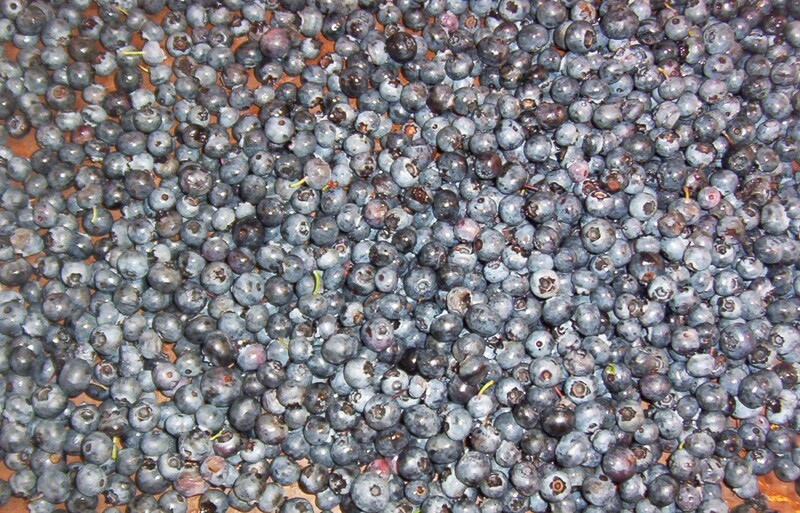 Put 2 cups blueberries in saucepan with 1/3 cup water, 1/2 cup sugar, and 1/4 tsp cinnamon. Cook over medium heat for 5 mins, stirring constantly. Add the 2 tablespoons flour, and the juice of 1 lemon. Turn up the heat and bring to a boil, still stirring - it should start feeling thicker. Remove from heat. When the crusts are done, remove from oven. 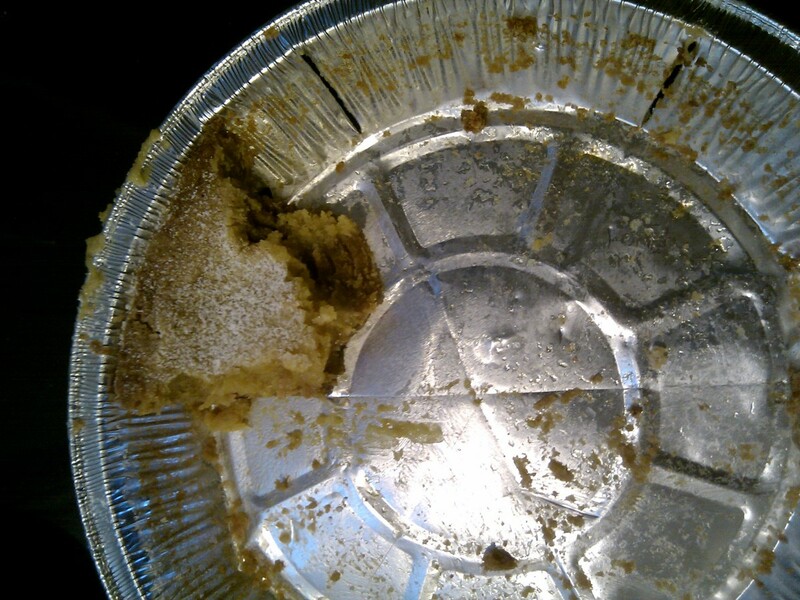 Take a butter knife and run it around the edge of each on, to loosen it from the pan. Spoon in as much filling as each cup can hold, and set aside to cool until serving. When you're ready to take them out, slide a butter knife gently under the side, and lift it to pop them out. Carefully, though - the crust is nice and tender, but that also means it can break easily! I'm glad you liked them! They were a hit with my classmates when I took them to school one day. I've spent the afternoon in the kitchen today, and I gave these a go, after hunting around for a muffin tray for 5 minutes. They turned out excellent! I tried one after it was cool enough and it was very tasty! 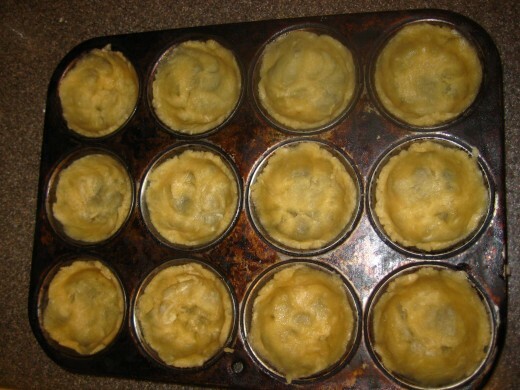 Mine weren't as pretty as yours, I might need a deeper muffin tray, but hot damn they were good. They look delicious, and dead easy to make! 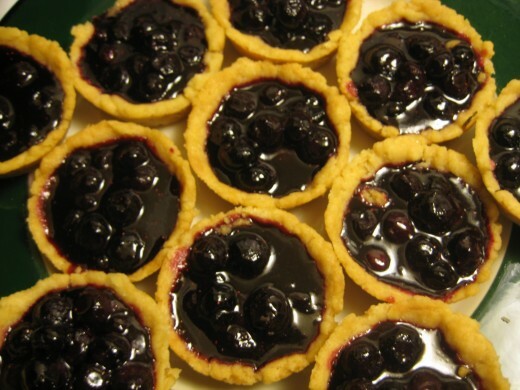 Soon my kitchen will be filled with lovely smells and watering mouths then blueberry tart carnage will ensue.